Share Track: Tap to display a Share Track pop-up window, which uses the built-in Android sharing feature and lists all apps you have installed that are enabled for sharing. If you select Gmail, for example, a standard Gmail Compose window opens, with the track and artist name as the e-mail subject and the track’s URL in the body of the e-mail. If you select TweetDeck, it opens up a Compose tweet in TweetDeck featuring the URL of the track (no artist or track information). Share to Spotify People: Send to a friend’s Spotify Inbox. Select this option to display a Send to Inbox pop-up window, which lists all your Spotify friends. Select a name to whom you want to send the track (you can’t add a message). If you press and hold a playlist name (as opposed to a track), you get the Share Track option, but not the Share to Spotify People. People are constantly sharing tracks to Twitter. Check out SpotiDJ to eavesdrop on the tracks people are sharing right this minute. You can link to virtually everything on Spotify, such as tracks, playlists, and search results. And these links work on your mobile device, too. You may need to confirm whether it’s OK for your web browser to open Spotify. 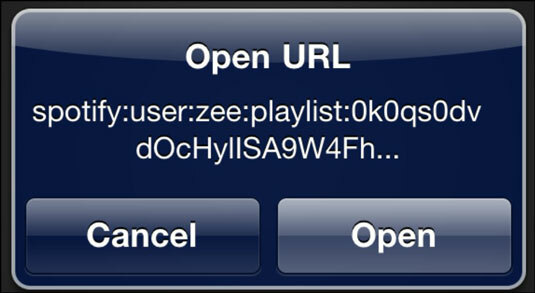 In the case of the iPhone, you tap Open in the pop-up window that appears when you try to launch a Spotify link.